We’ve seen the scene in movies and the media: prisoners, in uniform, digging ditches or picking up trash as a form of work. It’s implied that labour is a form of punishment – or sometimes, argues that such labour is a form of rehabilitation. In reality, prison labour looks a lot more sinister. Prison labour often involves inmates doing work for private companies for less than a dollar an hour. Jobs include tasks like packaging coffee for Starbucks, working as customer support for cell service providers as well as farming and slaughtering animals. Prisoners and animals alike are farmed out each day. 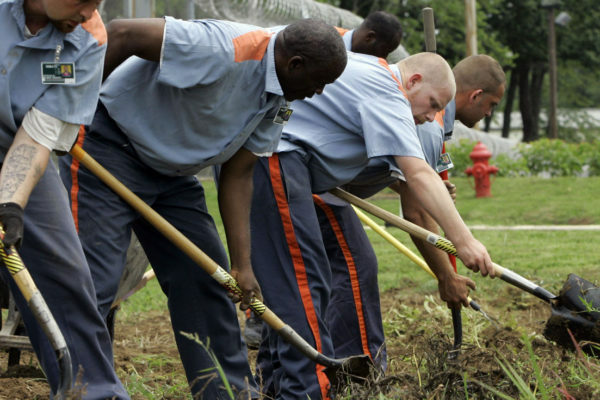 Inmates work gruelling hours and make pennies. Animals are slaughtered and their bodies sold as meat. And the prisons, often privately owned, profit. And though private prisons don’t exist in Canada, similar practices do. Inmates still make far below minimum wage and prisons are host to slaughterhouses and dairy farms where meat and milk are sourced out for a profit. While some argue that prison labour gives inmates a chance to be productive, to contribute to society and to be “reformed”, others liken it to modern day slave labour. The jobs assigned to inmates are strategically chosen – they’re jobs that require large numbers of people to perform gruelling tasks. They’re jobs that most people wouldn’t do if they had another choice. But working is often a legal requirement for inmates. In some cases, those convicted of crimes are sent to slaughterhouses and farms for unpaid work terms instead of prison sentences. It’s clear that the wellbeing of inmates is not the primary concern – or even a concern at all. The agriculture and animal agriculture industries are notorious for horrific work conditions. Undertrained and undersupported workers are expected to put in long hours in environments ripe with injury and safety hazards. While prisons reap millions in profit, prisoners make pennies and animals continue to be killed. Most young workers don’t want anything to do with manual labour jobs in meat and dairy, and as a result, a large majority of agricultural workers are marginalized people. As it becomes more and more difficult to find people willing to work in agricultural industries and corporations are left searching for workers, they can fall back on prisons. It’s cheap and regular labour – an easy win for them and a win for the prisons. A loss for the both the inmates and the animals, but who’s advocating for them? Surely not those in power. Prisoners in the past few years have started organizing mass strikes. Some initiatives have campaigned for animal slaughter to be removed from prisons. What can we do? Go vegan and support workers.